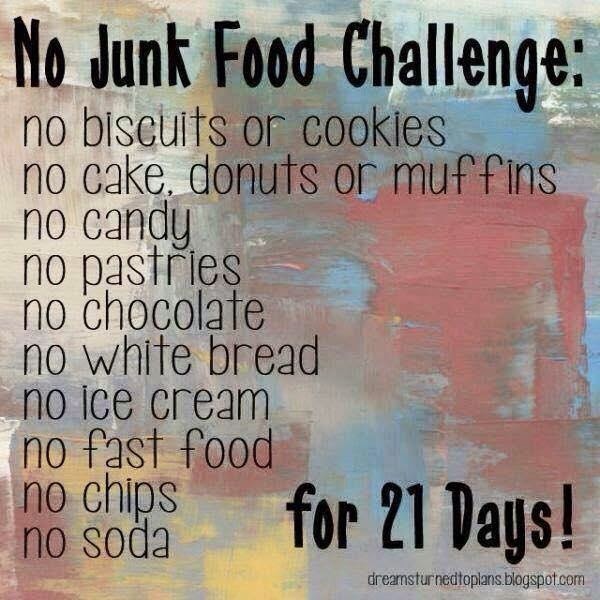 On April 6th, I started a 21-day “no junk” challenge. I weighed myself to kick it off but didn’t post the pic I took of the scale (and have since accidentally deleted it in an effort to clear up space on my phone...wah wah). I had gained some weight the previous week since I had been out of town and ate a BUNCH of things I don’t normally eat and didn’t exercise the way I wanted to for the most part. Now, I’d like to do a little diary-kind of review over the past 21 days. • April 6: no problems. I’m always good on the first day of a challenge or a diet. Nothing tempts me! I am invincible! • April 7: accidentally ate 2 little pieces of candy from co-workers. HOWEVER! I did refuse a donut that was offered by another co-worker. So…win! • April 8: still going strong. There was mighty temptation at work this day. Cookies and pastries out for all to enjoy. I refused. And I was actually only a little tempted. But, the moment I was like, “oh one cookie won’t kill me” I stopped myself. I told myself “no” immediately and said, sure, in the big picture it won’t hurt anything…but you are trying to do this challenge and it is ONLY 21 days long and you’ve done similar challenges where you cut out all junk food in the past and did just fine and those were for longer periods of time. I no longer wanted the cookie. WIN! • April 9: yet another good day. With my low calorie fresh-home-made curried chicken salad in whole wheat pita pockets for lunches this week, I have been consistently UNDER my calorie threshold each day, but a good bit too…even without exercise factored in! And I haven’t even been hungry! So, I might see about finding some sprouted grain pita pockets and having some fresh-home-made chicken salad again next week for my lunches! I will add more curry paste if I do as I can’t taste the curry paste at all in this week’s batch. I will also cut down the amount of lime juice used. • April 10: had a 5% off coupon from Target from my pharmacy rewards program that expired this day, so I figured I’d hit Target up for some groceries before work (gotta get what I need to make my healthy shrimp alfredo for the next night! Also, getting what I need to make the mushroom & goat cheese quesadillas I’ll be eating for lunch most of next week). I didn’t find everything I needed at Target so I went to HEB (local chain grocery store). As I was walking around HEB, there was all sorts of junky foods and even though I was hungry (hadn’t eaten yet), none of it was appealing. None of it. WIN! • April 11: this is the day before the Capital 10K! 7th biggest 10K in the nation! Anyway, in the spirit of running a race the following day and hoping to get a PR as well, I need to carb load. Normally, I go to Olive Garden or whatnot and get me a plate of shrimp alfredo. Now don’t you worry, I still had my shrimp alfredo, but I made it myself! I have a bunch of shrimp in my freezer, so I just thawed out 4 oz of it. And I have a recipe for semi-healthy alfredo sauce, so I whipped that up and served it over a double serving of quinoa pasta for some carbo loading! • April 12: I had my usual pre-race chocolate chip bagel from Einstein Bros Bagels. I also bought a banana when I was at Target the other day and froze it so that I could make a banana-almond milk-vegan chocolate Shakeology smoothie to accompany the chocolate chip bagel before my race. Normally, when I do these “no junk” type challenges, I nix all restaurant foods as well. However, I’ve been craving BBQ and, honestly, as long as you don’t get the high calorie side dishes, BBQ is pretty healthy and not super high in calories. So, I met my friend David for lunch after running the Capital 10K race at Terry Black’s BBQ in Austin, TX. It’s a spin-off of my favorite BBQ restaurant: Black’s BBQ in Lockhart, TX. Same family, same recipe. I passed on the banana pudding, coleslaw, cobbler, and sugar-packed sweet potatoes. I got some of the BBQ beans for a side and called it good. Well, it was all good until later that afternoon when I started feeling sluggish and blah and decided that I wanted donuts and an iced latte. Oops. Oh well, the donuts and the latte were good, and so was I. I got it out of my system. I try not to regret eating things I “shouldn’t” be eating when I eat them because that starts a vicious cycle of emotional eating. So I just accept that I ate something I “shouldn’t” have eaten and move on. And usually, when I eat something I shouldn’t necessarily be eating, it’s a one and done kind of thing. It’s not like I’m going on a junk food bender. • April 13: start of week #2. Back to the program. I did an 8 mile run this day that I had to drive to get to the place I wanted to run it at and I parked in a grocery store parking lot, so post-run I got myself a chocolate milk…but that’s not junk, that’s a legitimate post-run recovery thing and I ran a good run, so I earned it. • April 14: went to the gym this day. My gym is Planet Fitness. I know that they do the whole once a month pizza night, Tuesday morning bagels and cream cheese, and then the Tootsie Rolls that are at the front counter 24/7. I don’t even pay attention to when these things happen because they aren’t anything I am going to partake of. Anyway, when I got to the gym this morning, there was a table with boxes of bagels and containers of cream cheese all over it…and a sign that said to limit yourself to only 2 bagels. I thought about grabbing one since even without exercise I was going to be under my calorie allowance for the day, but ultimately decided against it. I’d much rather have some melba toast with peanut butter and honey on it after dinner if I am still hungry come the end of the day. But, I didn’t have that either. There were dark chocolate chips at the end of the day, however. • April 15: Schlotzsky’s had a deal going on for this day because it is Tax Day. A free original! Those are fairly “not too bad” for you as long as you don’t get any sauces on them and I don’t, so I had this for lunch on this day! But, it does still have about 570 calories, so I’m very glad I went for a 5 mile run this day. I also worked a double shift at work so I went to the store before work and stocked up on strawberries and cantaloupe for my extra snacks to make it through 16 hours of work. • April 16: this was another double shift at work, but it was pre-planned so I made sure when I bought the strawberries and cantaloupe the day before that I got enough for both days! • April 17: fried chicken happened. I was just craving it and couldn’t get it out of my mind, so I had some and now I’m good. • April 18: had a 5K this day in the morning. Post-race there was bagels and Chick-fil-a. I had one of each. There was a party. There were hot dogs, potato salad, brisket, meat & cheese rollups, summer sausage, deviled eggs, pie and cake. I didn’t hold back too much. I also don’t regret anything. • April 19: had some quality girl time with my awesome friend Amanda. We went and saw a movie and movies involve junk food. I got the fish and chips and honestly, it wasn’t a huge serving of either fish or chips like some places give you. I’d say about half of what you would get in a regular restaurant is what I got. • April 20: WOOHOO! Boston Marathon today! Also, start of week #3, the final week…dun dun dunnnnnnn! I ate according to my eating plan this day. • April 21: fail happened. I woke up feeling horrible…got hit by the allergy truck. I got a sausage, egg and cheese croissant sandwich and a couple small plain kolaches for breakfast and a Schlotzsky’s small pepperoni pizza for dinner. Ugh. • April 22: fail happened…again. Still not feeling great. Jack in the Box for breakfast and then there was a spread for a going away party for a coworker at work. This is it, though. No more junk until I go to Oregon. Even though this particular challenge ends this weekend, I’m going to just continue to stick to it until my vacation next month. And, even then, I’m still going to do my best to make the healthier choices during my visit. • April 23: day #1 again. Haha. But seriously, I’m starting this over like I said in the last entry. I’m going to control myself with the exception of a couple PLANNED meals out on the 25th and on May 2nd and those are only because I have races the next morning and I want to “carbo load” for them. And then maybe I will also eat out on May 3rd when I go to my friend’s house for the day after National Scrapbook day to do some scrapbooking. • April 24: holy cow! I cannot be trusted with food. Plain and simple. Someone please take away my food privileges. Seriously. I’m not joking. I had Taco Cabana today. • April 25: I went to Red Lobster and gorged myself on biscuits, a full order of shrimp alfredo linguini, and then some apple crustini dessert thing that was delicious. The biscuits and the alfredo were planned as I had a half marathon the next morning and this is my usual night before a big race dinner. • April 26: FINAL DAY! Had my half marathon this morning, went to Schlotzsky’s for a pastrami and swiss sandwich, no chips and then Frito pie for dinner (chili and Frito's with cheese). I did my final weigh in today, April 27th because that would be after I completed the 21st day, which was yesterday the 26th. Overall, I’m glad I did this challenge. I do love to get away from the junk that, honestly, I really don’t even like eating. But, because in the back of my emotional mind, “it’s comforting” to eat that crap when really it’s not. It makes me feel worse after I eat it than I felt before I ate it.